Ballroom dancing could help people with Parkinson's improve their balance and mobility. Researchers at the University of Southampton have been conducting a study to test the feasibility of evaluating the effects of ballroom dancing on the mobility of people who have the condition. It is estimated that 6.3 million people worldwide have Parkinson’s, a progressive, neurological condition that at present has no cure. Treatments are focused on reducing symptoms, however the risk of falling is high which can lead to serious injury. Studies into the benefits of other dances such as the Argentine tango or ballet on Parkinson’s have been conducted. 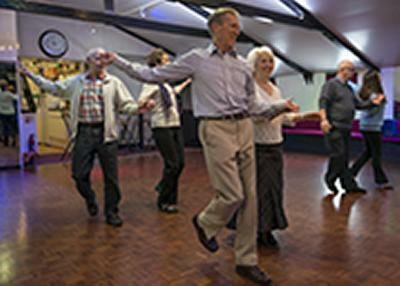 Professor Ann Ashburn, who led the Southampton research, chose ballroom dancing because it would enable people with Parkinson’s to dance with a partner and would encourage them to think about heel strike, coordination of movement whilst turning, balance control and greater step length, all of which are therapeutic goals. During the study, funded by the National Institute for Health Research (NIHR), Research for Patient Benefit programme, people who have been diagnosed with Parkinson’s attended dance classes twice a week for 10 weeks. Their mobility is measured at the start of the study and at three and six months to test the feasibility of providing dance classes and to measure the effects. Results were compared to a control group. Results have shown that participants’ who had Parkinson’s and took part in dance lessons had improved balance, confidence and posture. Professor Ashburn now hopes to increase the study to a nationwide clinical trial. She comments: “We were not expecting to find large differences between the groups in this small study which was designed to test procedures but we discovered that people who had previously fallen, those who had Parkinson’s for longer and men, appeared to benefit most from the dance in terms of their balance, their confidence and posture. In one year, a third of people over 65 will have a fall, but two thirds of people with Parkinson’s will fall over in the same period. After an initial fall or if people start to be unsteady, they could develop a fear of falling which will then have an impact on their mobility and result in reliance on a carer or healthcare service. Improving this will increase confidence and reduce costs. Professor Ashburn adds: “People with Parkinson’s tend to turn in a rigid way; in other words they turn their head, neck, upper body, pelvis and legs at the same time, making them unsteady. Dancing involves turning and stepping to a rhythmical beat from the music, which can help to improve their mobility. The principles behind the dancing, i.e. people have to move their feet, turn their bodies and take big steps – were carefully chosen to enhance what clinicians are doing during rehabilitation.